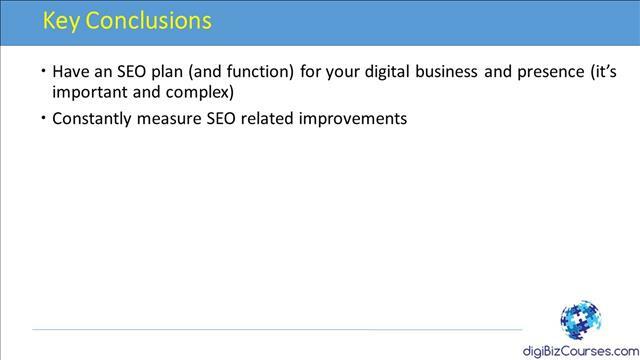 In this video tutorial session, we look at key tips and tricks to improve a website’s technical SEO or search engine optimization including its definitions. Topics include SEO Facts, Technical SEO Areas and Framework, The Indexing Process, Search Engine Indexing, Indexing Problems, Select Technical SEO Guidelines, Use of Sitemaps, redirects, Fixing Broken Links, Use of Internal and External Links, Meta tags, Improving Page Speed, and more. What is SEO and Technical SEO? So let’s get started. 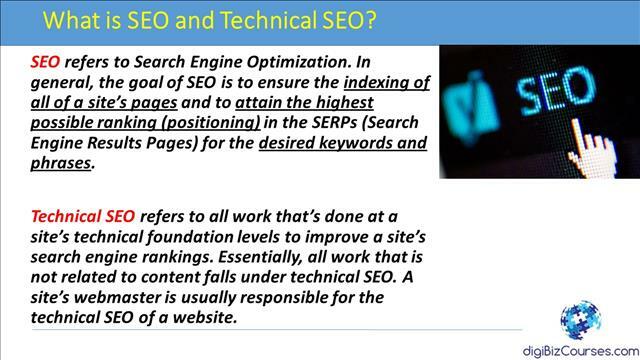 So first let’s look at some definitions of SEO and technical SEO. SEO refers to Search Engine Optimization. In general, the goal of SEO is to ensure the indexing of all of a site’s pages and to attain the highest possible ranking or positioning in the SERPs (or Search Engine Results Pages) for the desired keywords and phrases. So there are 3 things to note here number one is the goal of SEO is to ensure the indexing of all of a sites pages and this is important to stand because for some sites, specially for large sites, not all pages are indexed and as a result of that those sites are missing a big portion of their potential organic traffic. So one of the goals is to ensure the indexing of all of a site’s pages. The second goal is to attain the highest possible ranking or positioning for the pages that are already indexed in search engines; those are the pages that you see, for example, when you type in a query in Google you will see the results pages, so those pages are referred to as SERPs or Search Engine Results Pages. The third goal is to ensure that the pages that are indexed are ranked for the desired keywords. So, for example, if you’re trying to have your site positioned for certain keywords such as “buy watches”, you have to work at it to ensure that your site is being ranked with those specific keywords and not for some other general keywords for which there is not too much traffic. Next, let’s look at what is technical SEO. Technical SEO, on the other hand, refers to all the work that’s done at the site’s technical foundation levels to improve a site’s search engine rankings. Essentially, all work that is not related to content falls under technical SEO. A site’s webmaster is usually responsible for the technical SEO of a website. So, one of the things to note here is that technical SEO is relatively a new term and this term became more popular after content took center stage in boosting a site’s SEO. So any work that is done at the site level which is outside of content-driven SEO is usually referred to as technical SEO. And the technical SEO changes are usually more technical in the sense that they require a lot of configuration at the site level and at a specific page level. Before we get into reviewing the tips and tricks to improve a site’s technical SEO, let’s look at some key SEO facts. First is that Google continues to account for the majority of search traffic which is greater than seventy percent of all search traffic followed by Bing, Baidu and Yahoo. Baidu is the Chinese web search engine. So, this is one of the reasons that most businesses continue to focus on the search engine rules related to Google rather than the other search engines. The next fact is that SEO must be addressed right from the start of the building of a website. SEO must never be an afterthought rather it should be part of your consideration when you’re building a new website or as you’re building to add new pages or as you add more content to a website. The third point is that one of the most important factors for better search rankings is to build a digital business or site for the users and customers and not for search engines. Now, it’s been a while that Google has been harping on this point quite a bit and they’re stressing the fact that businesses and people should be building websites to provide a good customer experience for the users, so the web site should be built for the customers and for the users rather than for the search engines. And the idea is that if you build a good website which customers and users like, then Google is automatically going to place it high on their search rankings. The next point is that due to the ongoing changes to the search engine rules, a site’s architecture must be constantly updated according to the latest SEO guidelines to ensure its rankings in the SERPs. 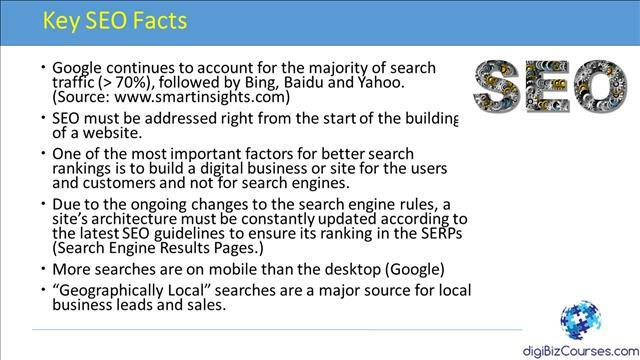 This is another important point; the search engine rules are changing constantly. As an example, a few years ago page speed or site speed was not a major factor in ranking of pages and sites but lately it has become a major factor and so there are other many such factors you have to ensure that you constantly stay up to date on all these search engine rules. Another point is that more searches are being done on mobile than the desktop- this is according to Google- and this should not be a surprise due to the skyrocketing use of mobile smartphones, you have to ensure that your site is optimized to run on mobile smartphones. In the final point that we look at is that geographically local searches are a major source for local business leads and sales. So if you have a local business listing , you want to make sure that your site ranks appropriately for local searches. Next, let’s look at the types of technical SEO guidelines that are out there. 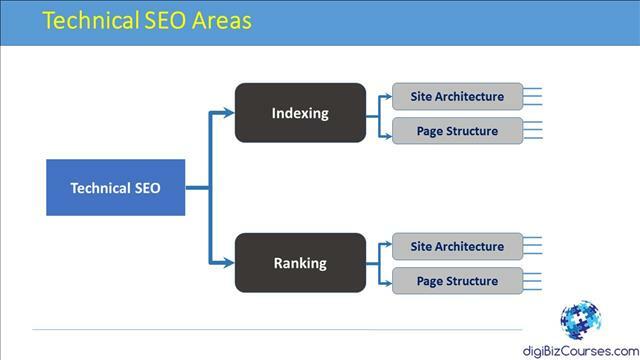 Technical SEO guidelines can be classified into two major categories; one types of guidelines have to do with indexing of the site and its pages in the search engine index and the second type of guidelines can be considered as those which have to do with the ranking of those pages within these search engines. Each of those two types of guidelines in turn either are site overall site or site related or they have to do with the specific pages of the site. So for example, the overall site architecture and how a site is structured in the hierarchy of the site is mostly a site architecture related issue. 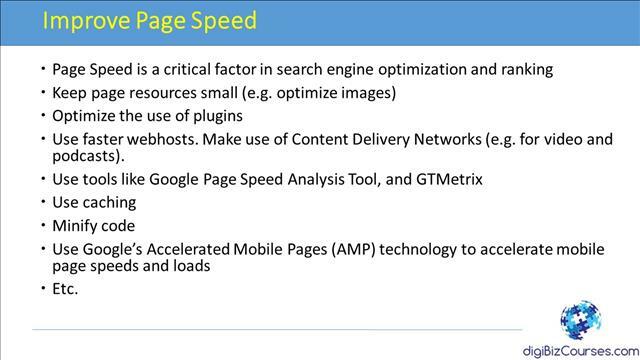 On the other hand, a page speed is more related to the specific page and the resources on the page and how fast and/or slow does the page load when a user requests that page on the web. So those are guidelines related to all of those. Next, let’s look at those in a bit more detail. How to create a Communications Management Plan? Next, let’s get an overview of the indexing process for search engines. 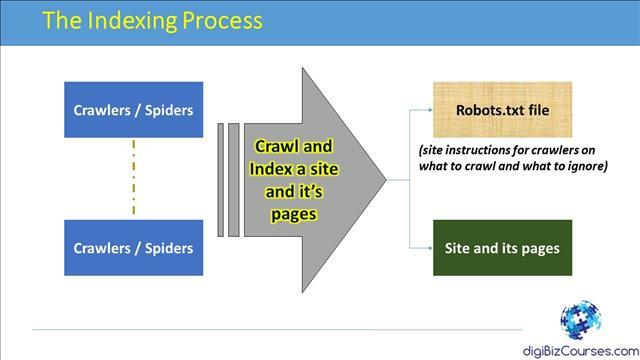 To understand the indexing process, it is important to understand the role of the crawlers and spiders; these are search engine programs that search engine sends on the web to crawl all different sites and their pages- their job is to go to visit different sites- so once a crawler and spider gets to a site, the spider essentially crawls a site and indexes all the pages of the site. And the mechanism in which the spider indexes a site has to do with the instructions that the site owner provides in the robots.txt file. The robots.txt file is essentially a set of site instructions for the crawlers on what to crawl on the site and what to ignore. So a webmaster, for example, may specify certain areas of the site which may contain secure documents, so the webmaster may make certain parts of the site as private and not allow the spider to crawl those areas of the site or, there could be other reasons to block certain parts of the site; for example, that could be as a webmaster you could be doing a lot of maintenance and fixing the site and it’s pages and you may desire to block access to those parts of the site until the time when the site is ready and until those pages are ready to be crawled. So in summary, the robots text file includes all those instructions for the spiders, so the spiders get to the robots.txt file they’ll look at those instructions and based on those instructions they’ll go and crawl the rest of the site and its pages and then include them in the index if none of the rules are violated. 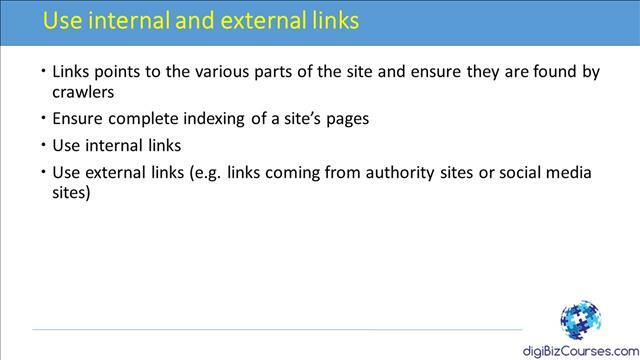 Next, let’s look at some of the search engine indexing rules and considerations. First of all, as a webmaster, remember to have a plan that ensures indexing of all the pages that you want indexed. So it is important to understand exactly what parts of the site you want indexed and what parts you don’t want and for the ones you do want indexed, make sure that you have a plan and you track their indexing until they all get indexed by the search engine. The second important point is to ensure that the mobile version of the site is optimized to be included in the Google’s mobile index. Now, this is an important point because recently Google had announced that it plans to use the mobile version of a site’s content to rank pages for that site. So again, it’s going to use the mobile version of your site to decide how these pages are ranked within the index. So this is a very important point. So you have to make sure that your site is first of all responsive and optimized for mobile, because if the site is not optimized for mobile, Google is not going to be indexing it and as effectively as it would for the sites which are optimized for mobile. Next, ensure that your site is optimized to allow all Google crawlers and spiders to crawl and index the site. So, as we have mentioned before that all kinds of crawlers and spiders that are meant for desktop viewing, spiders that crawl for video, images and so on and news kinds of sites and so on. So depending on the nature of your site make sure that your site is optimized to allow those specific types of Google crawlers crawl to your site. The next point has to do with ensuring that you include the right robots, metatags in the robots.txt file and that you and you have the right instructions and directives in those files or tags in terms of allowing or disallowing certain kinds of spiders on your site. If you have no such need and if you want all pages to be included in the Google search index, then there’s really no need to include the robots.txt file because in the absence of this file the Google robot or other robots are simply going to crawl the whole site. It is also important to regularly check for crawl errors and statistics in Google search console or Bing Webmaster Tools and to test the robots.txt file. So once in a while, there could be problems with the crawling, so it is important to go back and check the Google search console to make sure that there are no such errors and if there are errors then that you fix those errors. Finally, what you can do is that from time to time it is a good practice to go to Google yourself and check your sites index status by typing site column and your website address or www.xyz.com for example, and look at the results and make sure that all the pages are indexed in Google. If there are pages which are not present, then you have to go back and do some more research as to why they have not been indexed. 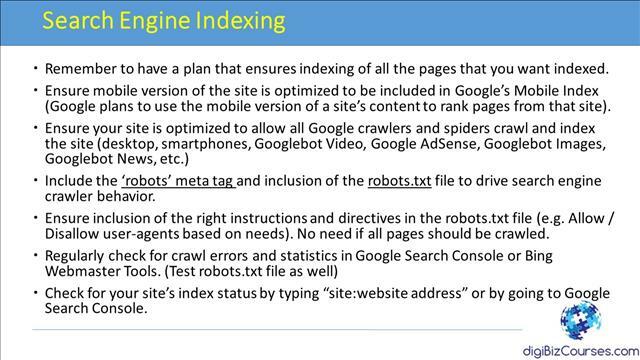 Some of the typical indexing problems that webmasters experience has to do with them including the incorrect instructions in the robots.txt file or the robot’s metatag. So if you don’t have the right instructions as we mentioned earlier then your indexing status may change. Another problem has to do with your site architecture, if a site architecture has multiple hierarchies and there are pages really buried within this site architecture, so the Google bots and spiders may have difficulty getting to those pages in the hierarchy. So Google… and there are a lot of best practices that have to do with including more of a flat, relatively flat architecture than having a very deep architecture. So you may want to check those if you’re having problems with indexing issues. You also may have issues related to content; you may have a lot of duplicate content if you’re having indexing problems so that’s something to check as well. Or you could be violating many of the other search engine guidelines, so it is important to keep tabs on those guidelines to ensure that you’re following all those guidelines. And there could be other indexing problems as well. Next, let’s look at some certain select technical SEO guidelines. 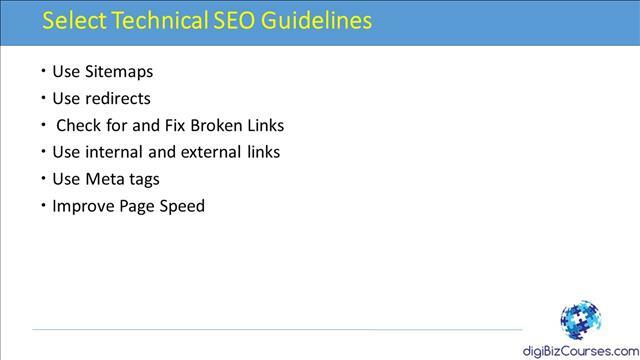 There are a lot of technical SEO guidelines, so we won’t to be able to cover all of those in this tutorial session but let’s look at some of them. So as an example, some of the key guidelines include using offsite maps, using redirects, checking for and fixing broken links, using internal and external links, use of meta tags, improving page Speed and so on. So in the next few slides we’ll look at those in a bit more detail. So the first one has to do with the use of site maps. A site map essentially is a file that contains all the pages of a site that you want the crawlers and spiders to index. So you should create that file and place it in the root directory of your website so that the crawler can come to that site and look at all the pages that you have indicated to be included in the index. 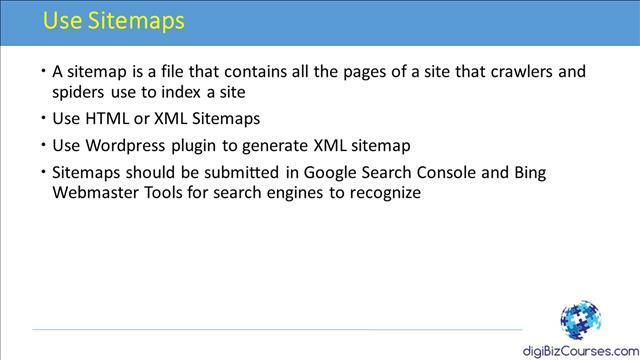 There are different standards for site maps; they are HTML-based or could be XML-based. If you’re using WordPress then there are plugins, for example, that you could install to automatically generate an XML sitemap for your website. Site maps should be also submitted in the Google search console and Bing webmaster tools so that search engines can recognize them. So once you have those sites you should log in to the console or the Bing Webmaster Tools, submit and test it to make sure that those search engines can recognize the format of those files. Once in a while you may have links that are no longer valid, so the page may have moved or you may want to remove certain pages of your website but those pages are probably still in the index. So if a user visits, searches for a certain term, comes across a certain web page on a search engine, clicks on it and if you have removed that page, they’re going to get a ‘Page not found’ error and that’s not a good thing. So what you want to do is you want to include certain redirects to redirect the user from that broken link to let’s say another page. 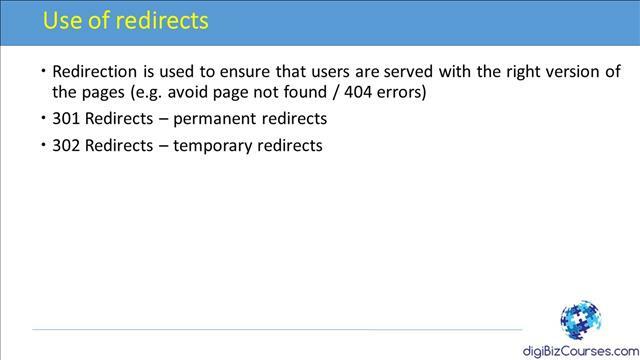 And there are all kinds of redirects; there are 301 redirects which are permanent redirects. If your page has moved from one location to another you want to tell Google that ‘look, this is the old location and you’re moving to a new location’ and over time then Google, it’s just indexed to include the new web page as opposed to keeping the old web page. Or you could include temporary redirects, so for example, you could be, again, fixing parts of a website and so temporarily you want a certain web page to be located at another location. Also you should check for and fix broken links. 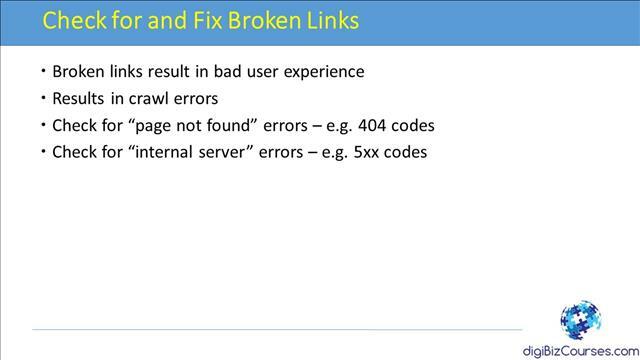 Broken links, as you know, can result in a very bad user experience and that could have a bearing on your Google search ranking. And they also result in crawl errors, and for the users it basically means that they would get a page not found error. So you want to make sure that you’re checking for all those kinds of broken links. Some links sometimes can result in internal server errors and they usually are represented by the 500 codes. So it’s important to check your site for those kinds of broken links and bad codes. It is very important for a site to have internal and external links. Link essentially points to the various parts of the site and the crawlers basically find those pages using those links. So if certain parts of your site are not linked from your main site, not only would the user not be able to find those pages, even the crawlers will not be able to find those pages. So you make sure that you include those internal links and that ensures that all the pages of your site are indexed. So you also want to use external links. So you want to make sure that your site is popular so that other websites are pointing to it. So you could have links coming from certain other authority sites or for example from social media sites. You should also make use of meta tags. 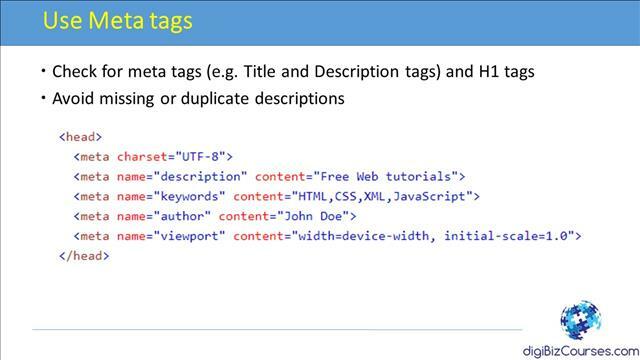 This is an example for meta tags from AH2 on meta tags. For example, certain meta tags have to do with inclusion of the title of the page or the description and also, you want to make sure that as you have different multiple pages, your title and description tags are not duplicated. You want to make sure that your title and description tags are not duplicated because each page is supposed to be unique; it’s supposed to have its own unique title and description. The next important technical SEO guideline has to do with improving page speed. Actually, this has become one of the most important factors and lately especially because of the extensive use of mobile. So you want to make sure that your page speed is improved. So page speed is a critical factor in search engine optimization and ranking. You have to ensure that the number of ways to make sure that the page speed is at it’s optimum. First is to make sure that you want to keep your page resources small. So for example, if you have large images you want to make sure that you optimize images. You should also optimize the use of plugins if you’re extensively using plugins and add-ins on your site. You want to optimize the use and you know basically what that means is you don’t want to overly use plugins on your website. And you should use faster web hosts. And also make use of content delivery networks. So, for example, if you have a lot of video on your website, you don’t want to include them on your website. It is important to host them on external networks which are optimized to deliver video. So for example, YouTube is optimized to deliver video faster than your site may be able to deliver the video to the end user. You should also make use of tools like the Google page speed analysis tool and GTMetrix, and those tools essentially tell you whether your site needs to be optimized regarding speed. You should extensively make use of caching, and also wherever possible, you should try to minify code so that the code executes faster. Also, there is another technology by Google called the ‘Google’s Accelerated Mobile Pages’ for the mobile pages. You want to make sure that you use that technology wherever possible to increase your page speeds and loads. So the key conclusions for technical SEO are that you first of all you must have an SEO plan and function within your organization to ensure that SEO is addressed for your website and not as a one-time thing but on an ongoing basis. And, you should also constantly measure SEO related improvements and make use of the various analytic tools to make sure that your site is improving in terms of the traffic that it is getting from Google and other search engines. At this we’ve come to the end of the tutorial, please note that digiBizCourses.com brings training and consulting on various aspects of digital business to stay up to date on future training content. Please ensure to sign up on our website, we have multiple tutorials included on the website so you could visit those tutorials and learn more.